Initially designed to answer the U.S. military’s need for a rugged medium transport, the C-130 Hercules has proved itself capable of a bewildering array of missions since its appearance in the mid-1950s. Named after Hercules, the mythological hero of classical times, the C-130 has gamely surpassed in number, if not in originality, the famous Twelve Labors assigned to its mythological namesake. In this visual “metaphor,” aviation artist Jody F. Sjogren creates a dramatic image of the C-130 at the moment of lift-off from an unimproved dirt strip. 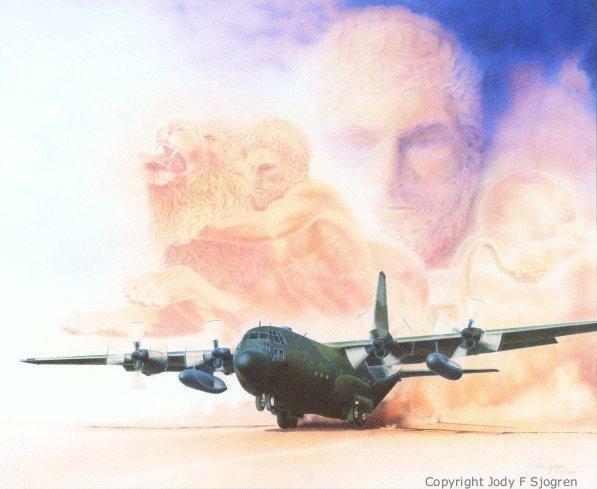 Out of the dust cloud that billows up around the aircraft emerges Hercules the mythological character, wrestling the man-eating lion of Nemea in the first of his twelve labors. Above this scenario, a statuesque portrait of Hercules views the action with an almost rational calm. Although the legend is myth, the story goes that he will earn his immortality by successfully completing his twelve superhuman labors. Lockheed’s venerable C-130 Hercules, a real-life workhorse, has surely earned its place among those immortal planes whose performance, versatility, and longevity have exceeded all expectations.